From hedgerows to meadows, wildflowers can be found throughout our green and pleasant land. In this book, journalist and garden writer Rosamond Richardson traces the history and myths behind each flower to discover the fascinating ways in which the plants were used. Discover which flower used as a medieval lie-detector to test the innocence of suspected criminals, or stuffed in the shoes of Roman centurions to prevent damage to their feet as they marched. From periwinkles, beloved of Chaucer, and the oxlips and "nodding violet" growing in the forest of A Midsummer Night's Dream, the book celebrates the important role wildflowers have played in literature, as well as their uses in food and medicine, and the history, myths, and tales behind each species. The 19th-century poet John Clare wrote, "I love wildflowers (none are weeds with me)." 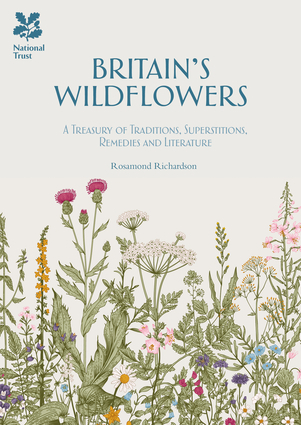 This book is a celebration of the bountiful history behind Britain's beloved wildflowers and is perfect for anyone with an interest in gardening, history, or the natural world. Rosamond Richardson is an author, journalist, and essayist. She is a regular columnist for Bird Watching magazine where she writes the monthly "Reflections" page. She also appears in The Countryman magazine, where her feature on wild flowers, "Natural Histories," is being followed in 2015 by a series on "Walking with Wild Flowers." Her "Flora Britannica" column appeared as a weekly feature in Country Life, and she has written for LandScape magazine.